Will Virginia Gov. 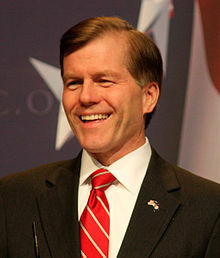 Robert F. McDonnell and his wife get indicted? Rosalind S. Helderman, Carol D. Leonnig and Sari Horwitz of the Washington Post report that the Justice Department last week had notified him and his wife that they would be charged in connection with a gift scandal. But the Post reports that senior Justice Department officials “delayed the decision after the McDonnells’ attorneys made a face-to-face appeal in Washington, according to people familiar with the case. Dana J. Boente, the U.S. attorney for the Eastern District of Virginia, told the McDonnells’ legal teams that he planned to ask a grand jury to return an indictment no later than this past Monday, people familiar with the conversations said. Some element of the lawyers’ arguments apparently persuaded the Justice Department to delay, according to people with knowledge of the case. The people spoke on the condition of anonymity because of the sensitivity of the case. On Friday, the day after the meeting, McDonnell’s attorneys were told that the decision would be put on hold, the people said. A final decision about whether to press charges is now not expected before Jan. 2, and could come as late as February, they said. Posted: 12/19/13 at 12:35 AM under News Story.